Wait a minute. The Sabres made a good-sized trade in August? Nobody in the NHL makes trades in August. Everyone is on vacation. Cottage country in Ontario is filled. Yet, Jason Botterill isn’t goofing off. 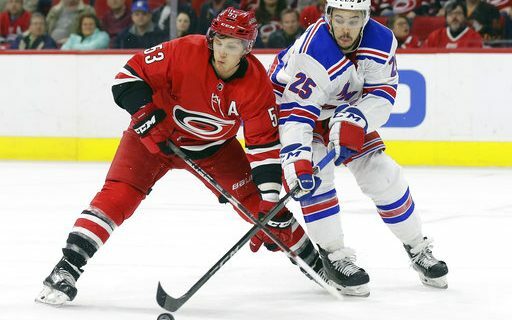 The Sabres’ general manager picked up veteran forward Jeff Skinner from the Carolina Hurricanes. In return, Buffalo bundled up forward Cliff Pu, a second-round pick next year, and a third- and sixth-round pick in 2020. In terms of immediate impact, the Sabres are the obvious clear winners. Buffalo picked up someone who has scored 30 goals three times, and gave up nothing that probably would contribute to the team next season. That ought to go over well with a fanbase that is looking for reasons for optimism next season after a dismal 2017-18. Skinner, 26, is an eight-year veteran in the NHL, and he’s been a relatively consistent scorer throughout his career. The former Calder Trophy winner finished with 24 goals and 25 assists for 49 points in 82 games last season. Skinner had a career-high 37 goals the year before. He probably will wind up as Buffalo’s top left winger, although we’ll see how that all sorts itself out in training camp. Skinner had a no-trade clause, and reportedly had vetoed potential transactions that would have sent him to other cities. However, he approved the deal here. With four first-round picks coming in the next two years, Botterill probably could afford to give up some picks in the “lower” rounds in the transaction. Skinner could be said to be something of an offensive “replacement” for the traded Ryan O’Reilly. Skinner has only one year left in his contract, and was said to be a likely candidate to depart Carolina as a free agent after the 2018-19 season. “We came out initially and said we were going to look at all opportunities, and as the summer went on I think (Skinner) felt it would be better if he got a fresh start someplace else,” general manager Don Waddell told the Raleigh News-Observer. If the Sabres can’t re-sign Skinner, he certainly could be a valuable trading chip at some point before the trading deadline. Pu was a third-round pick of the Sabres in 2016. He has scored at least 80 points in his last two seasons of junior hockey, getting 84 in 69 games last season while splitting his time between London and Kingston.